Use this report to track the stock movements of a product. Types of stock movement include sales, returns, deposits, deposit redeemed, shipping receipts, shipping orders, manual stock adjustments and stock takes. 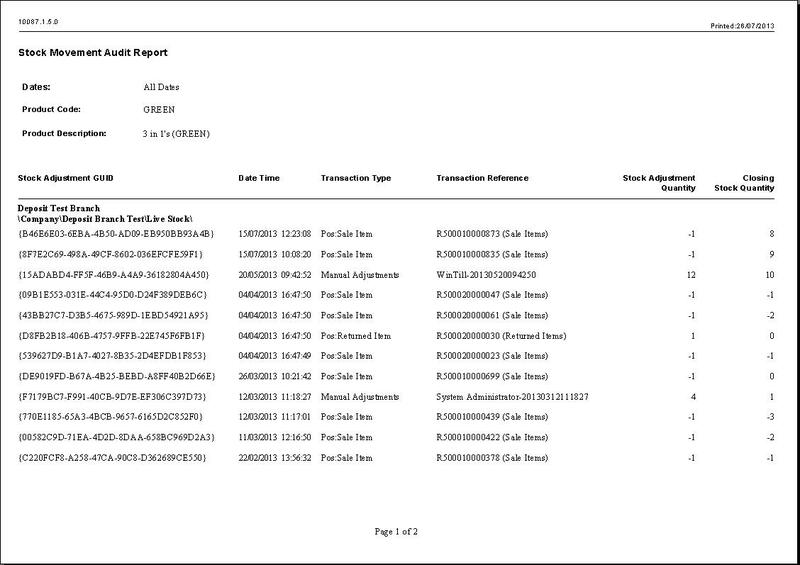 This report is particularly useful when a stock figure is incorrect at a certain branch and you need to analyse how this occurred. Stock Server Location – this is a list of branches. Each branch is its own stock server. 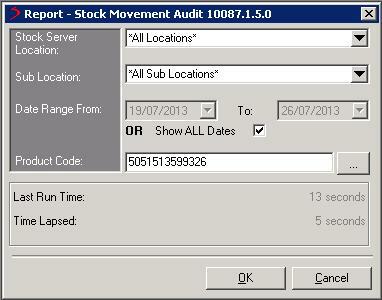 Sub Location – sub location within the selected stock server location. These can be anything from physical divisions to logical divisions such as first floor, second floor, stock room etc or live stock and deposit stock for example. Date range or show all dates – refine criteria by specifying a specific date range unless you want a complete stock movement history of the product. Product code – the code of the product in question. The “...” button beside this will allow you to perform a product search if you do not know this. The report itself will look similar to the example show below. The Stock Adjustment GUID is the unique identifier for identifying a specific stock adjustment. This reference is what is used in the Stock Adjustment Session report, which details the stock movements performed within that adjustment session. The report also details the date and time the stock adjustment occurred, the transaction type and reference, and the adjustment quantity and closing stock. Transaction type – this can be one of the following: sale item (Pos:Sale Item), return item (Pos:Return Item), deposit item, deposit redeemed item, shipping receipt, shipping order, manual adjustments or stock take. Sale, Return, deposit and deposit redeemed items – use the transaction viewer/search and enter the R reference number to view the sale transaction details. Alterinatively use the Stock Adjustment Session report, using the search criteria and entering the R reference into the Client Transaction Reference box. Manual adjustments – this reference will detail the reason for the manual stock adjustment. This reason will have either been generated automatically or specified by the user who performed the manual adjustment. If you want to see full details of this stock adjustment, use the Stock Adjustment Session report and enter the stock adjustment GUID. Shipping Receipts – this reference is the shipping receipt reference beginning with a K. The goods received note reference is also detailed, in brackets, beginning with a G. Use the G reference in the goods received note report to display full details of the goods received. Alterinatively, use the Stock Adjustment Session report, using the search criteria and entering the K reference into the Client Transaction Reference box. Shipping Orders – this reference is the shipping order reference beginning with a J. The shipping note reference is also detailed, in brackets, beginning with an L. Use the L reference in the shipping note and shipping note enquiry reports to display full details of the shipping note. Alterinatively, use the Stock Adjustment Session report, using the search criteria and entering the J reference into the Client Transaction Reference box. Stock Takes – this reference is the unique GUID reference generated for the stock take. If you need to print discrepancies for a particular stock take, use this reference when looking at previous stock takes in the Stock Take module. Alterinatively, use the Stock Adjustment Session report, using the search criteria and entering the unique GUID reference into the Client Transaction Reference box.